﻿﻿Annual festival offers challenging rides along scenic routes. ﻿﻿Shake off the winter blues and get ready for some fun in the sun! The fourth annual Chihuahuan Desert Bike Fest will bring together mountain bikers of all skill levels for three days of trail adventures and social fun at Big Bend Ranch State Park, Big Bend National Park and the Lajitas Trails, Feb. 13 through 15. 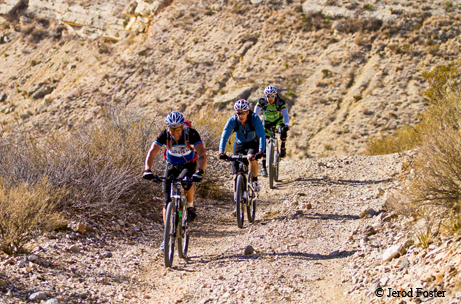 Each year, the Texas Parks and Wildlife Department partners with Terlingua-based outfitter Desert Sports to produce Bike Fest as a fundraiser for the Big Bend Trails Alliance. Lajitas Golf Resort and Spa will again host the event, with camping available at the resort’s Maverick Ranch RV Park. The 2013 festival drew close to 400 riders from around the world. Attendees can join the group rides or take off on their own if they have a park map with them. In 2013, representatives from Specialized allowed riders to try out their demo bikes on the trails. Bicycle Sport Shop, the Bike Barn, Bike Mojo, Bike Mart, Shimano and others offered support and sponsorship for the event. Post-ride fun each day included parties, dinner and live music in laid-back Terlingua and a chance to ride around on the Austin Bike Zoo’s fantastical bike creations. The 2014 event will follow a similar format. With more than 200 miles of multiuse and single-track trails, including the only International Mountain Bicycling Association “Epic” trail in Texas, Big Bend Ranch State Park has become a world-class mountain biking destination. The Epic trail, which can be extended from 54 to 70 miles, depending on a rider’s preference, is a favorite among Bike Fest riders. There is also a two-day Epic ride option, with an overnight stay and meals at the Sauceda headquarters bunkhouse. Austinites Tonia and Joe Graff attended Bike Fest in 2013 and plan to return this year. However, there are plenty of challenging rides for hard-core riders. In addition to the Epic trail, the 30-mile Rincon Loop ride, with its 2.5-mile single-track segment, the Chimney Rock Cutoff Trail, is popular with riders. The 18-mile Contrabando Loop and single-track Dome Trail segment, which also allows for a side trip to the historic Contrabando Waterhole, provide quintessential desert riding, as do the single-track spurs along the main road leading into the park. Park rangers will also lead slower-paced Chihuahuan Desert ecosystem bike tours, and there will be shorter rides for kids, along with rides in Big Bend National Park. Indeed, Big Bend riding is not only prickly but also rugged, hilly and challenging, and subject to extreme temperature changes. Riders should train for Bike Fest ahead of time and research the gear they’ll need. Several water stations will be set up in the park, but each biker should carry two to three liters of water a day and at least two self-sealing bike tubes — and know how to change a flat. For more information on the ride, visit the Desert Sports website at www.desertsportstx.com. To learn more about the trails at Big Bend Ranch State Park, visit www.tpwd.state.tx.us/bigbendranch or call the park at (432) 358-4444. The park website has downloadable maps and the Big Bend Ranch Biking Guide, with 26 ride descriptions, including the Epic trail ride.